Edi Rama — the mayor of Tirana, Albania, for 11 years — was an artist before a politician. Tirana, Albania’s capital city, was downtrodden when Rama took office. The city budget was squandered, corruption was rampant and crime was the norm. But Rama had an idea to raise the spirits of his town — he painted a grey building a bright orange. As Rama set out to have more of the city painted in loud colors and bold designs, he met resistance from other countries in the European Union. He was asked to opt for more neutral colors. To hear more about the radical transformation of Tirana, and about Rama’s thoughts on how politicians are not all the same and can bring hope to people through seemingly small actions, watch his moving talk. 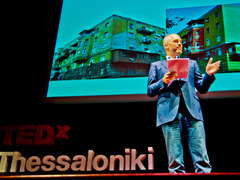 And here, see just some of the buildings in Tirana that got the color treatment. Pingback: Welcome to Tirana | Not here. What creative and colourful politics! Thumbs up!! If you want to “hear all voices in the conversation” you do it scientifically, through a study (survey, poll, focus group). Not through a random anonymous comment. The talk does talk about a substantial (minority) percentage of the population that didn’t like the change (and many oppose any change, even if it is for the better). And for the sake of giving everybody a voice, here is mine: I never had a desire to visit Albania. After seeing all these colorful and unique buildings I would definitely consider visiting.